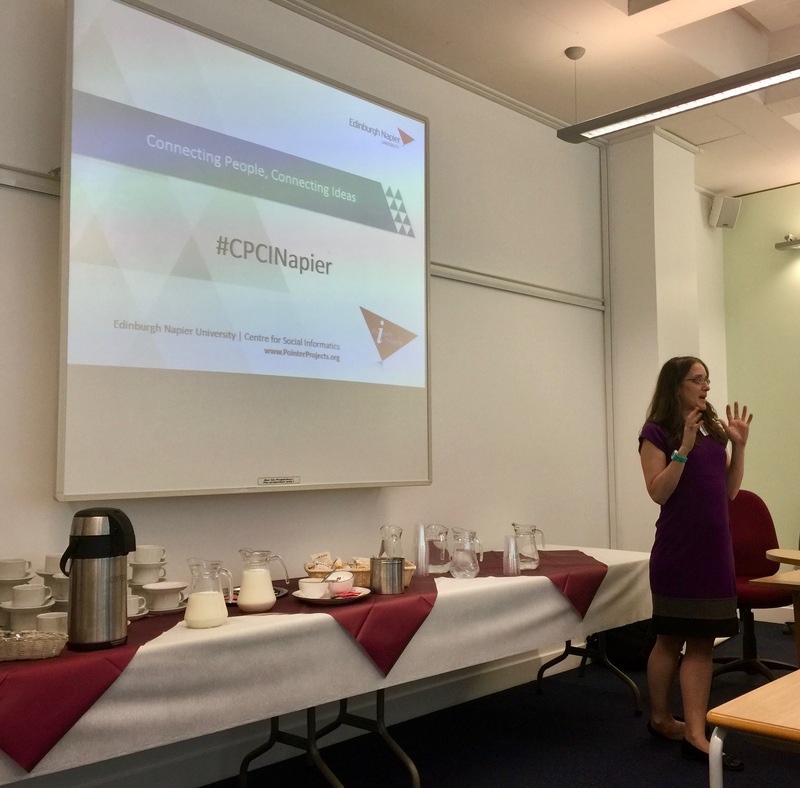 Researchers with interests in Everyday Life Information Seeking (ELIS) and information behaviours in online environments gathered at the Edinburgh Napier University Craiglockhart campus for the Connecting People, Connecting Ideas (CPCI) symposium last month on 22nd June 2017. The event was organised by Frances Ryan, with assistance from colleagues in Edinburgh Napier’s Centre for Social Informatics. The symposium attracted twenty delegates from a spread of disciplines – including Business, Computing, Information Science, Librarianship, and Sociology – with strong representation from PhD students and Early Career Researchers (ECRs). Participants came to the event from Scotland, England, Sweden, and Canada. To consider research priorities in the domain, and seed ideas for future work, such as grant applications, publications, conference papers, events etc, i.e. connecting ideas. The programme for the day began with an excellent keynote paper presented by Professor Simeon Yates, Director of the Institute of Cultural Capital in Liverpool. In 2016/17 Simeon has been leading a global team on the ESRC-funded project Ways of being in a digital age. Taking the form of a scoping review, Ways of being in a digital age addresses questions pertinent to the role of digital technology in our lives, and the ways in which technological and social change co-evolve and impact on each other. Simeon first related the main activities undertaken over the course of Ways of being in a digital age: literature review; assessment of research methods deployed in projects in relevant domains; and the hosting of engagement events*. He then spoke more broadly about conducting research that focuses on online environments, emphasising that to understand ‘digital’ there is a requirement for researchers from a mix of disciplines to work together, and to include researchers from inherently interdisciplinary (and ‘dangerous’) subject domains, such as Information Science. Simeon explained that his own current research interests relate to big social questions and the extent to which the digital replicates existing social class inequalities. He concluded that it’s not the technology, but rather human behaviours, that are important here. Simeon’s session ended with some interesting questions and discussion on class, psychology, the nature of work, and automation. The slides from Simeon’s presentation can be found on SlideShare and below. There is also a live-blogged summary Simeon’s of keynote presentation by Sheila Webber of the University of Sheffield on her Information Literacy blog. The rest of the day foscused on group work to develop the themes that had been determined prior to the symposium by the delegates through remote completion of an exercise using the Well Sorted tool. This earlier exercise resulted in the grouping of 49 individual research ideas into eight themes. 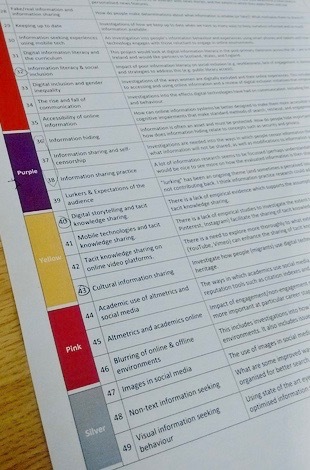 The themes were labelled by colour: orange (18 ideas); red (10 ideas); blue (5 ideas); purple (4 ideas); yellow (4 ideas); pink (3 ideas); silver (3 ideas); and green (2 ideas). On arrival at the symposium the delegates identified their two ‘preferred’ colours. This exercise revealed that it was worthwhile to start discussions on research ideas listed in five of the eight colour groups. 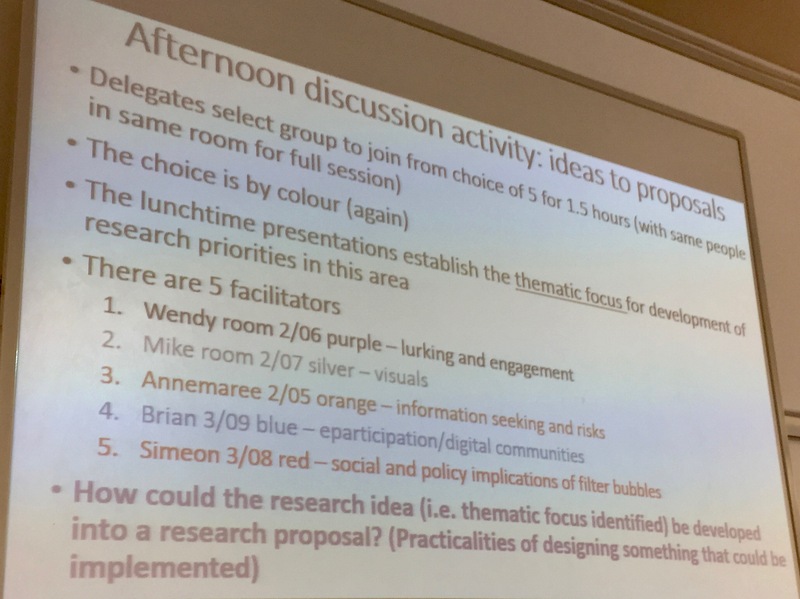 In the hour and a half immediately after Simeon’s keynote each delegate was therefore invited to work with others on the research ideas in two of the colour groups from the total of five (i.e. 45 minutes on each one selected). After lunch delegates regrouped to spend the main part of the afternoon focused on one of the topics listed above. They had the option of sticking with one of the ‘colours’ to which they had contributed in the morning (which was the case for everyone for silver), or going elsewhere. This resulted in a further reduction in the number of group discussions. In the end there were three groups of almost equal size that worked on three topics: (1) information seeking and risk; (2) social and policy implications of filter bubbles; and (3) visuals. By the end of the day everyone had contributed to an extended discussion of one topic, guided by a series of questions designed to prompt discussion on developing a broad research idea into a key research question, and how this might be addressed, as shown in the photograph below. 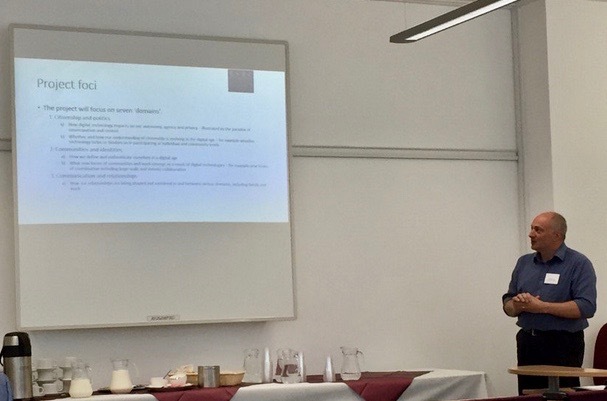 Frances Ryan brought the event to a close by chairing a discussion on plans for the group members to stay in touch and share resources, and how funders could be persuaded to invest in important interdisciplinary research areas related to ELIS and online environments. It was clear by the end of the day that the symposium was a great success. Particularly impressive was that one of the afternoon discussion groups had made so much progress with a research idea that its members agreed to continue their work after the symposium, with tasks already allocated to one another and a date set for a conference call in July. Feedback on the day included the following comments: ‘inspirational’, ‘great research seminar’, ‘great day of sticky notes and inspiration’, and ‘valuable, stimulating connection opportunity’. We look forward to hearing in the future how participation in the symposium has helped individuals develop their research networks and refine their research ideas. *One of the events hosted by Simeon’s project is the Ways of Being in a Digital Age review conference, for which there is currently a call for contributions. 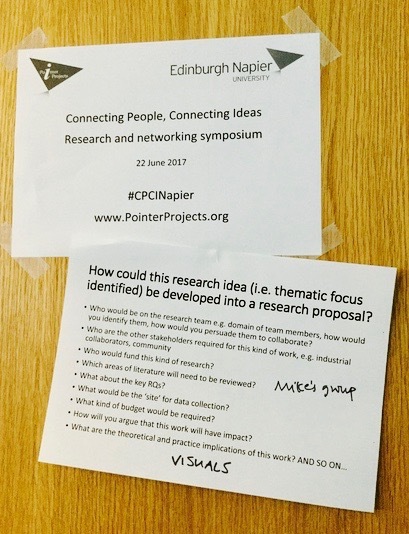 This entry was posted in Events, Projects and tagged #CPCINapier, Annemaree Lloyd, Centre for Social Informatics, conference, CSI, Edinburgh Napier University, ELIS, Frances Ryan, information science, Mike Chantler, research, Sheila Webber, Simeon Yates, Well Sorted, Wendy Moncur by Hazel Hall. Bookmark the permalink.